Toroghinejad, M., Dini, G. (2006). Effect of Ti-microalloy Addition on the Formability and Mechanical Properties of a Low Carbon (ST14) Steel. International Journal of Iron & Steel Society of Iran, 3(2), 1-6. M. Toroghinejad; G. Dini. "Effect of Ti-microalloy Addition on the Formability and Mechanical Properties of a Low Carbon (ST14) Steel". 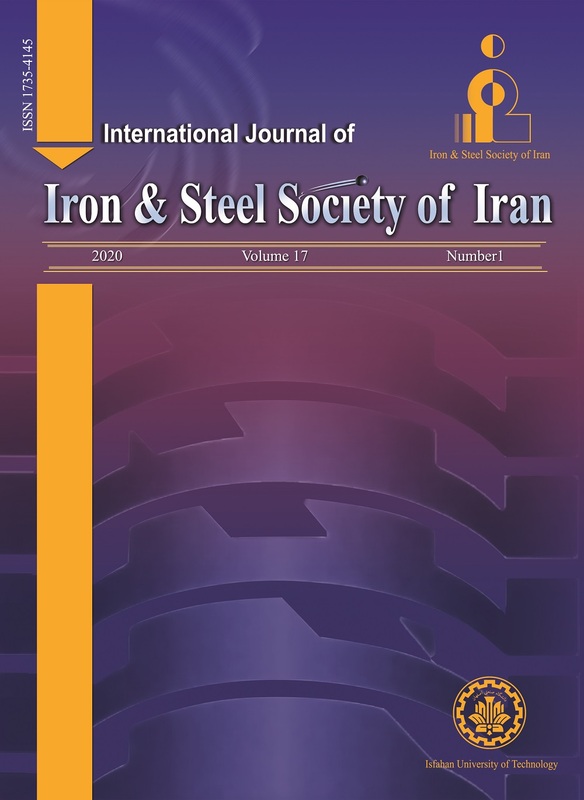 International Journal of Iron & Steel Society of Iran, 3, 2, 2006, 1-6. Toroghinejad, M., Dini, G. (2006). 'Effect of Ti-microalloy Addition on the Formability and Mechanical Properties of a Low Carbon (ST14) Steel', International Journal of Iron & Steel Society of Iran, 3(2), pp. 1-6. Toroghinejad, M., Dini, G. Effect of Ti-microalloy Addition on the Formability and Mechanical Properties of a Low Carbon (ST14) Steel. International Journal of Iron & Steel Society of Iran, 2006; 3(2): 1-6. A low carbon Al-killed Ti-added steel was produced in Mobarakeh Steel Complex in Iran. Mechanical properties and microstructural characterizations of steel in the as-cast, hot-rolled, cold-rolled and annealed conditions are presented. Dilatometery tests were carried out to measure the finishing and annealing temperatures of steel. It was found that the addition of small amounts of Ti increased the transformation temperatures. In addition, microalloying with titanium improved the ductility of the produced slabs and hot rolled steel sheet. However, low temperature annealing of Ti-added cold-rolled steel sheets led to a decrease in ductility. The results indicate that the full softening of the Ti-added cold-rolled steel is completed for an annealing time of 2hr at 800°C. R. Mendoza, J. Huante, M. Alanis, C. Gonzalez-Rivera and JA. Juarez-Islas: Mater. Sci.Eng.A, 276(2000), 203. R. Yoda,I.Tsukatani, T. Inoue and T. Saito: ISIJ Int., 34(1994), 70. R. Mendoza, J. Camacho, G. Lugo, C. Lopez, L. Herrera, J. Reyes, C. Gonzalez and JA. Juarez-Islas: ISIJ Int., 37(1997), 176. S. Akamatsu, M. Hasebe, T. Senuma, Y. Matsumura and O. Akisue: ISIJ Int., 34(1994), 9. S. Carabajar, J. Merlin, V. Massardier and S. Chabanet. Mater. Sci.Eng.A, 281(2000), 132. S. Yim, P. Wray, KM. Tiitto, CI. Garcia and AJ. DeArdo: ISIJ Int. 43(2003), 1615. R. Lagneborg, T. Siweek, S. Zajac, B. Hutchinson: Scand. J. Metall., 28(1999), 250. F. Leysen, J. Neutjens, K. Mols, S. Vandeputte and Y. Houbaert: Mater. Sci. Forum, BasqueCountry,Spain, 284-286(1998), 263. D. Bai, J. Asante, M. Cooke and J. Dorricott: 43rd MWSP Conf. Proc., Vol XXXIX, ISS, Warrendale, PA; (2001), 543. EJ. Palmiere, CI. Garcia and AJ. DeArdo: Mater. Sci. Forum, BasqueCountry,Spain; 284-286(1998), 151. M.A. Akoy, E.S. Kayali and H. Cimenoglu: ISIJ Int. 44(2004), 422. B. Engle: Proc. of Inter. Sympo.Niobium,Florida,USA, (2000), 675. V. Thillou, M. Hua, CI. Garcia, C. Perdrix and AJ. DeArdo: Mater. Sci.. Forum, BasqueCountry,Spain; 284-286(1998), 311. I.Gupta and D. Battacharya: Pro. Int. Con. on Metallurgy of Vacuum-degassed Steel Products, TMS,Warrendale,PA, (1989), 43. WB. Hutchinson, KI. Nilsson and J. Hirch: Pro. Int. Con. on Metallurgy of Vacuum-degassed Steel Products, TMS,Warrendale,PA, (1990), 109. I.Tamura, C. Quchi, T. Tanaka and H. Sekine: Thermomechanical Processing of High Strength Low Alloy Steels. Butterworth: Butterworth & Co. Ltd,. (1988), 19. H. Kejian and T.N. Baker: Mater. Sci.Eng.A, 169(1993), 53. DO. Wilshynsky, DK. Matlock and G. Krauss: Pro. Int. Con. on Metallurgy of Vacuum-degassed Steel Products, TMS,Warrendale,PA, (1989), 247. H. Hayakawa, Y. Furuna, M. Shibata and N. Takahashi: Testu-to-Hagane; 69(1983), S594. W. B. Hutchinson, Int. Metals Rev. ; 29(1984), 25. R. K. Ray, J. J. Jonas, and R.E. Hook: Int. Mat. Rev. ; 39(1994) 129. K. Ushioda, N. Yoshinaga, K. Koyama and O. Akisue: Proc. Conf. on Physical Metallurgy of IF Steel, ISIJ,Tokyo, (1994), 227. KM. Titto, C. Jung, P. Wray, CI. Garcia and AJ. DeArdo: ISIJ Int., 44(2004), 404. S. Wang: Mater. Sci. Eng. A, 145(1991), 87. M. R. Toroghinejad, A.O. Humphreys, D. Liu, F. Ashrafizadeh, A. Najafizadeh, J. J. Jonas: Metall. Mater. Trans. : 34(2003), 1163.